Disclosure: I received a free product in exchange for this review. For my review I received a Gwin. A Gwin named Jebus. And we had a blast, yay!! I was so excited when I received my Gwin! 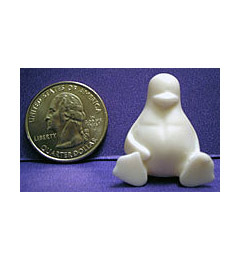 "The Gwin is a curious creature based on Tux, created by Larry Ewing & The GIMP. Gwins spend most of their time eating, sleeping, and hoarding treasure. They often form "armies" to protect their amassed riches. Now is your chance to build your own Gwin Army to guard your prized possessions! " I've always loved collecting things. When I was little I always collected bouncy balls. Why? I just took an interest in them. There are so many different colors and designs. The Gwin is the same thing, only each one is a piece of art and did I mention; there super cute! There are only select quantities of each Gwin. For example there are only 400 of each design ever made for both series 1 and 2. And then there are only 200 of each Gwin in series 3; So these are pretty collectible. Any little kid would treasure a Gwin! There cute and even if they didn't save and collect them, they'd still have a blast playing with them! Christmas is right around the corner, so if your looking for something truly unique then look into October Toys. 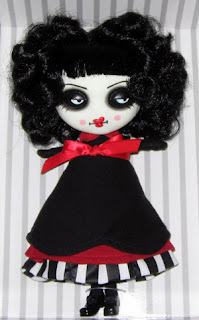 Beside the Gwins, October Toys have some other great toys like the Posiez. And I wasn't going to do another but I LOVE the Mini Gwin! How could you say no?! Look - He's about as big as a quarter, aww! And seriously, how could you say no for only $2.00? They also have a MegaGwin which is super cute! Ohh! So like I was telling you before - I received Jebus. He is super cute! 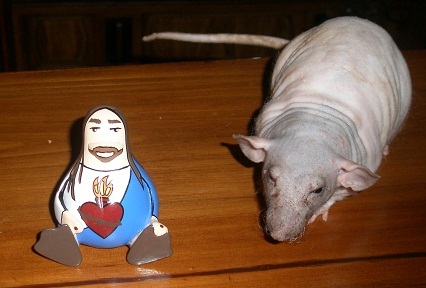 My rat Little Luis and Jebus are best friends now :)! Heres Little Luis and Jebus telling jokes. 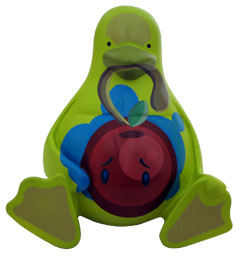 I love my Gwin Jebus - he is so adorable and I will definitely be adding to my collection! Disclosure: Review product was provided to me free of charge. All opinions expressed are my own and were not influenced in any way. Love the Lyllionia. She's cute. I have never heard of these! Thanks for sharing! snack time Gwin is my favorite :) and I love the prices are reasonable. My kids would love these! $2 is awesome! Those are so cute! My kids would love them and at $2 I love them! Those are the most unusual little things! Kids will love them! Those are the most unusual looking little things! kids will love them! I'm loving the Rubber D. Gwin! These are actually really neat, I think its something my daughter would love! Are These So Adorable I Want One Or Two Or Three!! LOL! Thanks!! Oh my gosh he is adorable. Love him with all the little poses. Gwins are so cute! I don't know where to get that here in Manila. You always find the neatest toys! Enjoyed my visit! I never heard of these nor had I ever seen them anywhere before-not even on line! They are adorable. I am not familiar with these characters but really they are so cute especially that Gothic looking doll but I think it does not belong to the package you got. How cute. I like the one you got, but the duck one is really cute, too! It looks like they're having quite the conversation! How cool are these. I never heard of them before.. Very unique and different. Those are really cute! My daughter would love to collect them! My first meeting with a Gwin :-O, I know shock horror, where have I been. Loving Rubber D !! Although my vote goes to all of them but Rubber D. is my new Mr. Adorable! The Gwins looks cool and perfect for decorations. Kids will love these and I guess rats as well! Great post! Haha Jebus! What a great name. My kids would adore those. They love collecting anything little. These are the funniest little toys. Rubber D is beyond cute! Lyllionia is very cute! My niece who loves Monster High dolls would probably love her. My son would love those toys! Yikes. That looks like a very scary creature. Nope. No thank you. I am too squeamish! I do not have what it takes to have a pet like this. *Woosie here! That mini-gwin is really cute! These would be really neat to collect. Those are the cutest! First time ever seeing them and they are affordable too! I've never heard of Gwins before, you learn something new everyday! I love collecting! im not sure if my daughter will love this haha though maybe for boys this looks like a cool toys! I've never heard of Gwins before. Where do you learn about them? I have never heard of these toys before. It goes to show, you can learn something new everyday if you try. How long have these been around, cuz I have no clue what they are, but the ducky is cute! That is sooo funny that your rat plays with Gwin Jebus!! My biggest things I collect is lighters and pens. There are so many different once of each. I might have to start doing the Gwins now. I always wanted one. ty for sharing. These are super different. I think my kids would like them though. I haven't heard of Gwins before, but the look interesting and cute. The Little Rubber D is awsome! I've never heard of Gwins before! My brother, sister, and I totally collected the bouncy balls from the quarter machines at the grocery store. And these teeny plastic aliens. It was always such a bummer when we got one we already had! Oh my! It looks a little interesting but cool! Very nice! Hadn´t heard about these either. I wonder how many other toys are out there that haven´t reached mainstream yet. All three of my kids would have a hoot with this! 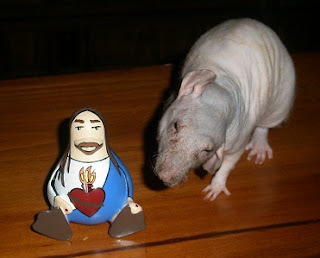 Your rat is really cute! 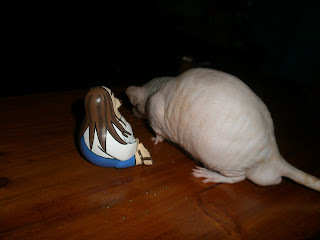 I used to have rats too. They are really smart animals!